I've whipped up another printable template for use as calling cards or business cards. This time it's an argyle motif, so put on your sweater vest and nerd glasses and help yourself. Choose from orange cards, pink cards, or blue cards. 1. Click a link above and save the PDF to your computer. The file may take a moment to download, so please don't hyperventilate if your browser window remains blank for a moment. 2. Optional: The fonts used in the card design are Serif 6 Bold and Regular, available for free right here from Betatype. Download the .zip file and install these fonts on your machine (see here for how to install fonts). If you're not that picky, you can choose not to install the fonts. In that case, your computer will substitute a font when you open the file and it might look just fine. 3. Open the PDF in Adobe Reader (free) and type your information in the text fields. 5. Print the file at 100% on a sheet of white cardstock. Trim with an X-acto knife or scissors, using the crop marks as guides. For a different card design, click here! Yep, I'm aware that one more row of cards could theoretically fit on this page, but my home printer needs 0.6" for a bottom page margin. That means the bottom row of crop marks won't print, which makes trimming much more difficult. Perhaps your printer is the same way, so I engineered these to be better safe than sorry. Also, this template does not match any Avery business card stock templates. That stuff is a bit expensive and I didn't want to require anyone to buy it in order to use these. this is great! Thanks so much!!! These are really cool-- can't go wrong with argyle:)! Another beautiful set! I printed out one of your other freebies for my niece to use as gift tags/calling cards. I used heavy white card stock and my paper cutter and it worked out fabulously! Thanks for another great share!! these inspired me, I love them! These are pretty darned snazzy! Thanks so much! Love any home made paper product! These are so chic! Thanks for all the details! Lotta R Guile, ha ha! Love these! Totally using these for temporary business cards. Thank you so much! Oh these are pretty! I've been wanting to get myself some name cards. I'll make some once I get my printer ink refilled! I love argyle! Thanks for sharing! Thank you so much for this post. I want to let you know that I posted a link to your blog in CBH Digital Scrapbooking Freebies, under the Page 6 post on Jun. 02, 2011. Thanks again. I also really enjoyed the last set you made, thanks for sharing! 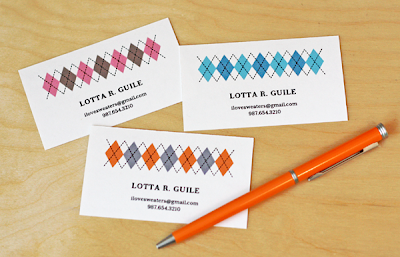 I've been thinking about business cards lately. Thank you SO much! Thank you so much for this idea , very attractive business cards. Great project! I just made some and they turned our really cute. Thanks for the clear instructions. Thank you so much for sharing these! They are AMAZING (as are all of your projects)! I featured your project and gave you lots of credit and a link back here on my blog: http://www.thecraftyscientist.com/2011/06/favorite-things-roundup.html. Check it out if you want and thanks again! I have enjoyed your first batch very much! I even dropped them in the fish bowl to have laminated during my hotel stays - I have them hanging on every bag I own! So handy! Love the argyle! 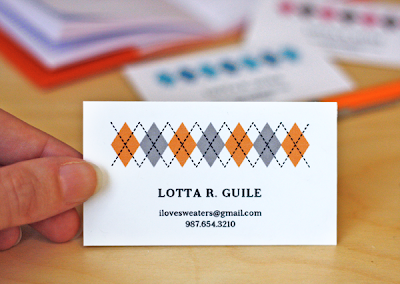 Love these argyle business cards! Hi there! I used this to make magnets that I give to my students at the beginning of the year with all my contact information on it. A post about them will be on my blog tomorrow. Thanks so much! How can I find just the blank template you used for creating my own business card? I love your's but I want mine double sided! this is great, thank you very much.